Closer Look At The Horrible Violence Against Avril Lavigne! This poor girl. We know she's tough and scrappy, but she's still quite tiny and she obviously was unable to defend herself against such inexcusable violence. A source has sent us this EXCLUSIVE PICTURE of Avril Lavigne, showcasing the damage done to her face from the bar brawl she was caught up in this weekend at the Roosevelt Hotel. As you can see, she suffered a really heavy blow to her eye, with a pretty deep gash just above the lid, as well as some nasty scratches on her cheek and face. 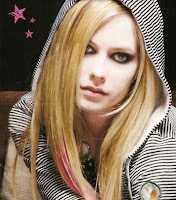 Our source reports that Avril is hanging in there and that she is thankful for her fans for all their love and support. We're also told that Avril hopes that this horrible ordeal will send a message to others and encourage them never to resort to such violence themselves and respect others despite any circumstance. We've said it before and we'll never stop saying it: Violence is never the answer.